With fast-paced Press developments and incorporating the latest technologies, Lien Chieh Machinery (LCM) is widely known for their ability to manufacture customizable PCB and CCL Laminating Hot Presses. By always implementing new and productivity boosting innovations, all our PCB Laminating Press Machines and CCL Laminating Hot Press Machines are leading the industry. 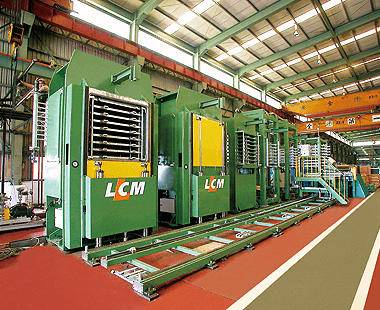 By importing the majority of our materials inventory used in the production of Hydraulic and Mechanical Presses, LCM ensures the highest quality structures and Press performance. Furthermore we assemble all of our PCB Laminating Presses and CCL Laminating Hot Presses in-house, which guarantees excellent quality and efficiency due to strict materials testing, leading manufacturing procedures, as well as scrupulous quality control. With our very versatile production experience we can custom build Press solutions to suit all our customers’ wishes, such as our CCL Laminating Vacuum Hot and Cold Presses. We always use the highest quality seamless tubing and forgings, as well as the most accurate and reliable pistons to make sure all of our Hydraulic and Mechanical Press Machines operate flawlessly. Lastly all LCM’s Presses are equipped with easy to understand and easy to operate control systems for impressive control and increased safety.